The Romans were obsessed with the acquisition of honor. In aristocratic life, people longed to ascend the cursus honorum, the course of honors. One would ascend this course of honors by acquiring more and more prestigious titles. Hence, if you were a Military Tribune, your goal was to become a Quaestor. If you were a Quaestor, you longed to be a Praetor, and so on. At the top of the honor food chain was the "kyrios," Caesar himself. At the bottom of society were slaves. This stratification based on honor was pervasive even outside of Rome. Social scientists have noticed a phenomenon in Roman colonies known as value replication. Local municipalities replicated the values operative in Rome, and conjured up their own systems of honor acquisition. 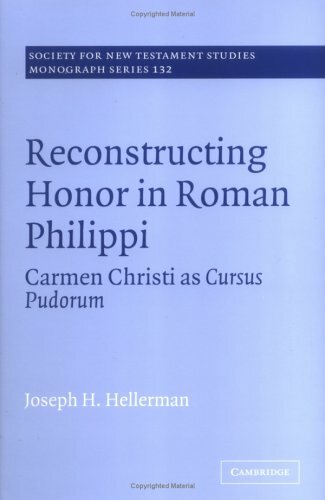 Thus, if you went to a city like Philippi, you’d find a local course of honors for that particular municipality. Even slaves came up with their own hierarchies of honor. Needless to say, humility wasn't considered a virtue in this milieu. Paul seems acutely aware that this mentality has influenced behavior in the church at Philippi, and commends a life that is utterly counter-cultural. He believes that the cross turns the entire system of honor acquisition on its head. In Philippians 2:6-11, Jesus begins at the top of the honor food chain, reining in regal resplendence. However, instead of using his lofty status as a means of exploitation (just like a despot or Caesar), he humbles himself. He does not ascend the cursus honorum but descends the cursus pudorum, the course of ignominies. He descends to the most shameful position imaginable in Roman society, that of the crucified slave (2:8). What Paul says next would have been most shocking to the Philippians. Because Christ takes the course of ignominies, the path of shame, God exalts him (2:9)! God honors the crucified slave who willingly brings shame upon himself! Even Caesar must now bow before this crucified-resurrected Lord (2:10-11). Christ decisively demonstrates that the path of humiliation is the path of honor, and thereby invalidates the Roman worldview. It's noteworthy that Paul's main point in Philippians 2:6-11 is ecclesiological (cf. Phil 2:1-5). He wants the Philippians to exhibit the disposition of Christ in their interactions with one another. Hellerman's construal gives us much food for thought. But hey, don't take my word for it. Go buy his book.